Community engagement is at the heart of our business. Each year, we support our communities by partnering with trusted organizations, volunteering thousands of hours of volunteer service, and contributing financial aid to educational programs, community rebuilding efforts and disaster relief. Take a look at some of the ways our Lowe’s Heroes give back to their communities. Since 2003, we’ve partnered with Habitat for Humanity International to help families build strength, stability and independence in the United States. Since our relationship began, we’ve contributed more than $63 million, helping more than 5,500 Habitat families build a better future for themselves and their families. National Women Build Week: Lowe’s has supported Habitat’s Women Build program since 2004 and helped launch Habitat’s National Women Build Week in 2008. During the 2016 9th Annual National Women Build Week, more than 17,000 women worked on 650 homes to help 1,000 families have a home in time for the holidays. To kick off the week, Lowe’s and Habitat hosted a “Girls’ Night Out” in 10 cities across the country to empower women and encourage social volunteerism. 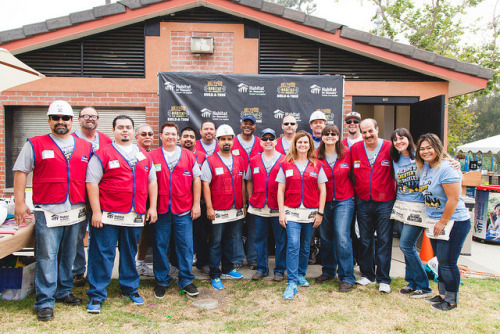 Hollywood Build: In June 2016, 400 Lowe’s Heroes came together to construct and rehabilitate homes in the Los Angeles area. The team painted and did exterior work for three homes that would soon be filled with Habitat families who never though homeownership was within their reach. As one Lowe’s employee said, “I may be helping someone today, but I am getting back so much more than I give by participating.” We couldn’t agree more. Jimmie Johnson + Lowe’s + Habitat: In March 2015, nearly 100 Lowe’s Heroes joined six-time NASCAR champion Jimmie Johnson and his crew to help frame a four-bedroom home in partnership with a local family before the Kobalt 400 race. Prior to stepping in his car, Johnson handed over keys to the new home to the family. It was so successful, we did a similar event this year, too! We’ve partnered with Boys & Girls Clubs of America since 2009, providing grants and volunteering time to help improve and refurbish more than 130 Clubs across the country. In August 2016, we launched our largest initiative yet, Renovation Across the Nation – $2.5 million in grants to renovate 50 Clubs in all 50 states by January 2017. Working with our national partners – the First Response Team of America and the American Red Cross – Lowe’s is helping impacted communities get the relief they need while putting necessary measures in place to make communities more resilient. 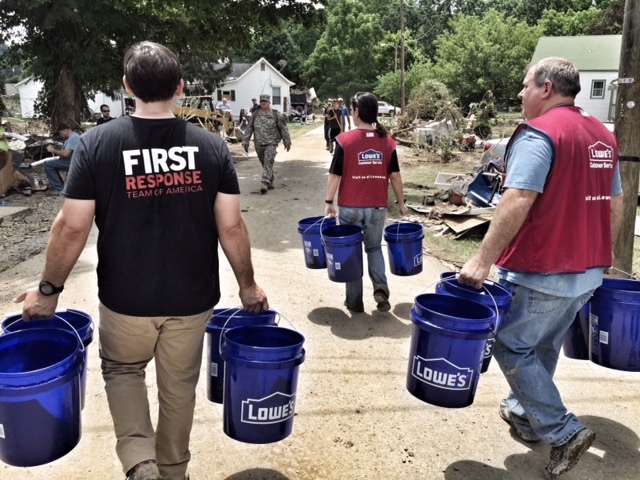 Since 1999, Lowe’s has donated more than $26 million to Red Cross relief activities, and more than $2 million in grants to First Response since 2012. Flooding is an often occurrence in many of the communities we call home. 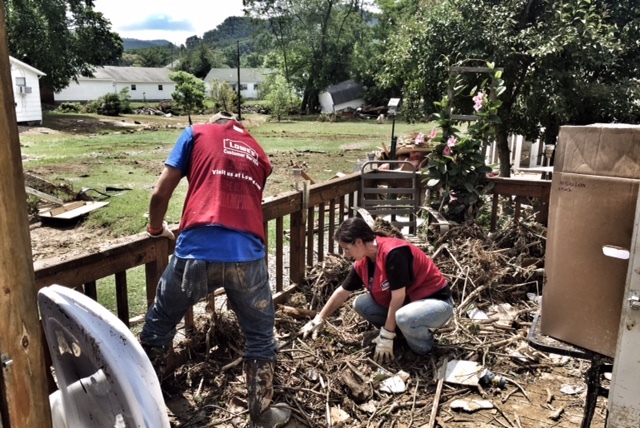 When historic flooding hit West Virginia in July 2016, our local teams were able to act quickly to organize a cleanup project in the immediate aftermath. We worked with the West Virginia Division of Homeland Security to assist flood victims by shipping more than 30 truckloads of critically needed supplies to the affected area. In addition, Lowe’s donated $250,000 to the American Red Cross to help those affected. For almost a decade, Lowe’s has supported Rebuilding Together in its efforts to rehabilitate homes in vulnerable communities. Each year, Rebuilding Together mobilizes nearly 100,000 volunteers to support thousands of community revitalization projects across the United States. Through charitable grants and volunteer activities, we provide critical renovations and revitalization services to assist low-income community members across the country. Since the start of our partnership in 2007, Lowe’s has committed $15 million in charitable contributions and nearly 31,000 volunteer hours, benefiting more than 15,000 people with essential renovations, including safety and accessibility enhancements and energy-efficiency upgrades. Learn more about the work of Lowe’s Heroes and stay up to date on the latest employee volunteer efforts by following Lowe’s Careers.